The world's premier artist of the oceans and its creatures, Wyland, has teamed with Martin F. Weber Co. to produce a line of fine art acrylic colors. They are formulated with pure, intense pigments and the finest acrylic emulsion and ingredients. The 14 concentrated colors have a thick, buttery consistency. They feature excellent archival permanence and exceptional lightfastness. Some Wyland Ecological colors dry with a matte finish while others exhibit a satin to a modest glossy sheen. Like the final finish of the colors, opacity varies by pigment from transparent to opaque. Each tube label carries its corresponding opacity and lightfastness rating. 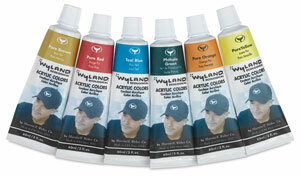 These colors are ideal for painters working in the style of Wyland. For over 25 years, the world-renowned marine life artist and conservationist, Wyland, has dived and painted the undersea world. His palette of fine art acrylic colors was developed for artists who share his love and concern for the preservation of the oceans, its creatures, and the surrounding coastlines.